Ever since his first solo exhibition at Galerie m Bochum in 1993, Spanish artist Alfredo Álvarez Plágaro’s Identical Paintings have been a permanent fixture at the gallery. Now his latest works are on view, some of them conceived especially for the exhibition space, and are once again inspiring amazement and irritation. The Identical Paintings consist of multiple repetitions of the same motif, painted in exactly the same manner. They thus contradict our traditional notion that a painting must be a discrete, one-of-a-kind original artwork. 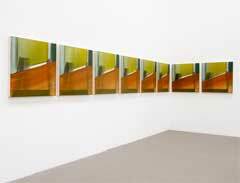 Plágaro dramatizes this contradiction between repetition and uniqueness and adopts it on various levels as the principle behind his painting. This seems all the more surprising since painting in and of itself, by contrast with printing or photography, is not a technically reproducible medium. Every repetition must be created by hand, coming about in a simultaneous painting process. Every picture is thus both original and reproduction. This discrepancy opens up a wonderful paradoxical game that casts doubt on conventional judgment criteria. Interestingly enough, repetition, rather than suspending the significance of the individual work elements, reinforces it instead. The pictorial idea thus takes shape several times, resulting in an emphasis that one picture alone could not attain. The viewer’s glance wanders from picture to picture, busily comparing them, and thus perceives the versatility of the painting as well as the fine, specific differences in the individual elements all the more keenly. These fine differences are not incorporated systematically, but rather emerge from the parallel painting process. Plágaro does not pursue the depiction of a specific motif here, but rather takes painting itself as his subject. A further, startling feature of the Identical Paintings is the variety of ways they can be presented, calling into question the principle of a classic, unambiguous pictorial composition. 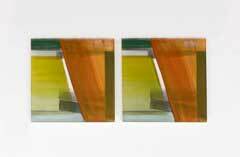 Plágaro succeeds in bringing the forms, surfaces and colors into such a finely calibrated balance that his pictures are no longer governed by a specified positioning in terms of up, down, left or right. Another possibility for variation is offered by the arrangement of the individual elements. They can be hung either next to one another, over one another, or as a block. These many options for orientation and arrangement result in a large number of conceivable appearances for each individual work and the greatest possible measure of freedom in their hanging. Plágaro’s Identical Paintings make manifest such opposites as freedom vs. rules, uniqueness vs. repetition, identity vs. difference, in the process dissolving traditional hierarchies – and doing it by way of outstanding paintings.